A long time ago, I watched Peter Jackson's film Heavenly Creatures for the first time and found myself captivated by the murder that inspired the film; since then I've watched it a number of times and just recently discovered the uncut version which I watched during a week when my husband was away on business. I'm not really a major true crime person, but there are some cases, like this one, that stick in the mind. This case took place in the early 1950s in New Zealand, where, as the author tells us, "murder of any kind was a major event," and that at that time, there were maybe two, three murders a year. He also says that Women who killed were rarities" and "As for teenage girls, matricide -- it was unheard of." Lately my interest was reopened after reading Beryl Bainbridge's fictional take on the case, Harriet Said (1972), which changed the story but was most certainly loosely based on the Parker-Hulme case of 1954. Then, one insomniac night a couple of weeks ago, I stumbled on a documentary about the case, which made me want to watch Heavenly Creatures again, which then made me look for a true account of the murder, which led me to this book. I will say that as long as Graham sticks to the subject at hand, it's a book worth reading; it's when he goes off on tangents of details that I could have cared less about that I found myself tuning out. "breathless, greatly agitated, with bloody hands and clothing. One girl's face with spattered with blood and the other's finely speckled." She then learned that there'd been some sort of terrible accident and that the woman who'd been with them not too long before was now "covered with blood" somewhere "Down in the bushes -- down the track," according to the girls, having slipped on some rocks. Mr. Ritchie and his assistant went to find the woman but obviously it was too late when they arrived, since Honorah was dead. While the girls had called it an accident, Ritchie realized that there were "no rocks anywhere near," and not too far from her head lay a "half-brick with blood and bits of hair on it." The girls were taken to Juliet's home while police examined the scene; the investigators soon knew that this was no accident, but that "the deceased had been attacked with an animal ferocity seldom seen in the most brutal murders." What was worse, however, was that they also realized that "this savagery was the work of two teenage girls," a "thought too shocking for words." After this beginning, which, coincidentally, mirrors that of Heavenly Creatures, Graham goes on to examine the lives of the two girls, both separately and together, in order to come to a conclusion as to why Pauline's mother had to die that day. While I leave his findings for other readers to discover, using a number of different sources, most pointedly Pauline's own diary, he paints a chilling picture as to what may have led up to that particular moment; he also goes on to look at the aftermath of the crime and its effects on the girls, the families, on the people in Christchurch, and its interest as the "murder of the century" that would later lead to plays, books, much debate, and a movie. While he's focusing on all of that, the book is captivating and hard to put down, and there are great photos in this book that help bring it to life. But I started finding my interest waning here and there as he throws in superfluous details that I could have cared less about (for example, the athletic prowess of the Hulme's attorney at his high school and then Cambridge, or the Hulme's psychiatrist's wife's love of theater etc., etc., and more unnecessary stuff down to what people were eating for lunch), and it became a major skimathon to get back to the meat of the story. Another thing: this book could have ended some 50-something pages earlier which would have, I think, made it a stronger piece of writing; my final niggle is that there are no footnotes. Sources are listed in the back but there are several spots where quotations are left unattributed and it drove me nuts. I know -- nerdiferous people such as myself are probably the only people who appreciate footnotes, but to me they're important and should be included in investigative pieces. My biggest issue here is that I was not at all impressed with the change of title of this book, and in fact thought it a sort of cheap, exploitative publishers' trick. When originally published in 2011, it was called So Brilliantly Clever: Parker, Hulme and the Murder that Shocked the World; when it came to the US it became Anne Perry and the Murder of the Century, which sort of bypasses the fact that there were two girls involved. 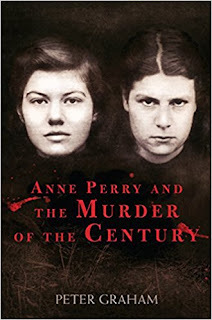 It's also highly misleading: we don't discover the modern-day of Juliet Hulme as Anne Perry until very late in the book, at which point we also discover the post-prison identity (Hilary Nathan) of Pauline Parker. But where's Hilary Nathan in the title? Obviously the title change was done to sell more copies of this book since there are thousands of Anne Perry fans out there; personally speaking, I think it's a cheap tactic. Having said all of that, however, while on topic it is a book I'd recommend for anyone with an interest in the case who wants to know more about it -- Graham has done a pretty thorough job here that will answer pretty much any question someone might want answered. It's actually one of the most chilling true-crime stories I've read. 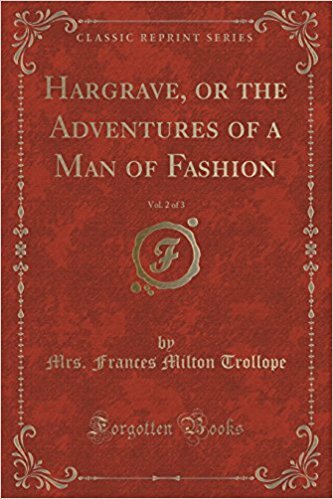 back now to my history of mystery project with *Hargrave, by Frances Milton (Fanny) Trollope. When I decided to read early crime literature this year, I picked up all kinds of nonfiction books on the topic to help me figure out what exactly to look for. 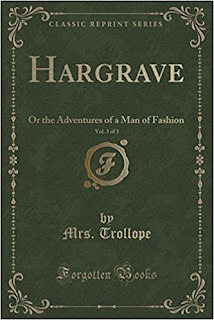 I came across Hargrave, Or the Adventures of a Man of Fashion in an excellent book by Lucy Sussex called Women Writers and Detectives in Nineteenth-Century Crime Fiction: The Mothers of the Mystery Genre. 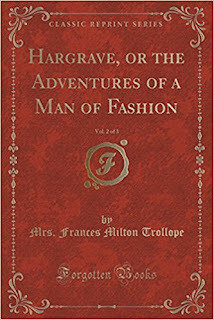 Frances Milton (1779-1863) was a most prolific author with some 34 novels under her belt and seven works of nonfiction. She married barrister Thomas Anthony Trollope in 1829, and they had seven children, including Anthony Trollope, who would go on to become "one of the most successful, prolific and respected novelists of the Victorian era." After the family fortune went from bad to worse, Fanny, son Henry and her two daughters left for America in 1827, returning to England in 1831. 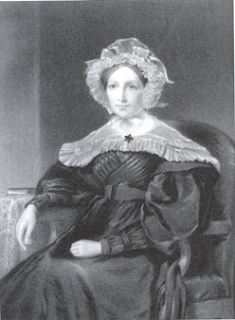 Her travels and experiences led her to write her famous Domestic Manners of the Americans," which as the Oxford Dictionary of National Biography (ODNB) notes, "launched Fanny's career as writer." (Just FYI - the link will take you to a subscription-only page, but I will give the reference anyway -- article 27751.) After her Domestic Manners, she began trying her hand at fiction, publishing her first novel in 1832. 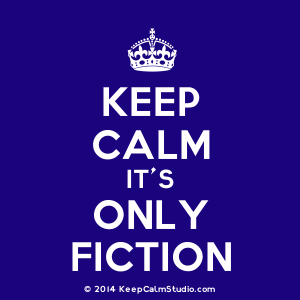 The ODNB article notes that she "experimented with several different genres," including Gothic fiction, social themes, including an anti-slavery novel, Jonathan Jefferson Whitlaw, which was published in 1836. Later she would go on to write books with "melodramatic plots," aiming to "hit the somewhat lowbrow taste of the circulating library," seriously right up my alley. And so now we have Hargrave, published in 1843, her sixteenth novel. 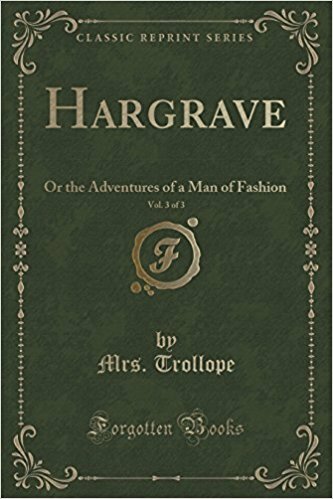 As with so many of the authors I read, her work has mostly been forgotten, but thanks to one of my favorite publishers, Forgotten Books, I was able to pick up Hargrave complete in three volumes. Anyway, to get down to it, the story focuses on Charles Hargrave and his family, who are living in Paris as the story begins. Hargrave is a widower with one daughter from his marriage, Sabina, and a stepdaughter Adèle de Cordillac. His dead wife's sister, Madame de Hautrivage, also lives with the family, along with a number of servants. 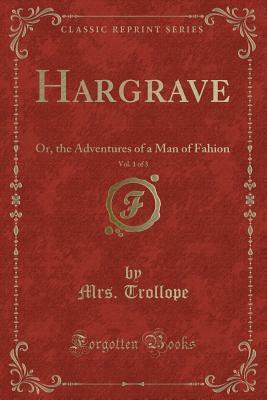 Hargrave's reputation is such that he is a man with a gigantic fortune, well known for his huge gala balls that run into the wee hours of the morning, his fine taste in clothes, etc., and he is at the top of the social ladder of the city. It isn't too long though until we discover that it's all a sham and that he's become desperate for money, in debt to several people and having bills he's having trouble meeting. He keeps his secret from the rest of his family and the rest of society, however, and goes on living the high life.He knows that he must get his daughters married off to wealthy suitors and depend on them to take care of him. Meanwhile, the police are looking for answers as to who's been robbing high rollers coming out of a local club called Riccardo's. While Adèle and Sabina are meeting the men of their dreams (the plans of which are thwarted soon enough), Hargrave has a huge fete (another one of his gala extravaganzas) and has invited a certain Madame Bertrand along with her husband to attend. She is rich and flaunts her wealth by wearing diamonds sewn onto her dresses, but at the end of the party around 4:30 a.m. or so, she turns up missing. Hargrave's opinion is that the young lady has eloped, gone off with a lover. There's a big problem brewing, though, and that's Adèle, who had heard and seen things both during the fete and afterward from her bedroom window. She decides to investigate on her own, and discovers certain evidence that leads her to believe that Hargrave is involved, and decides that the family should make a run for it. However, before all of this plays out, at the same time Mme. Bertrand had gone missing, Adèle had sent her servant Roger Humphries on a personal mission that will later come back to bite the pair of them, since the police are out in force looking for Mme. Bertrand's abductor; Roger just happens to be at the wrong place at the wrong time. The family makes up some rather stupid but credible excuse to feed to the chatty aunt about why they're leaving and establishes a false trail in case anyone comes after them. In Volume three, our fugitives are safely ensconced incognito in the forest near Baden, and while Charles is missing his once-great life, Adèle has begun to hate him, knowing exactly what kind of man he really is. Things come to a head when she learns that Roger's been imprisoned for the kidnapping and supposed murder of Mme. Bertrand and she realizes that she has the power to save him. Charles is too caught up in worrying about his own reputation and his own future to let her go and threatens to lock her in to prevent her leaving. While I won't reveal how things play out , I have to say that Trollope has spun a cracking good yarn with this book, which over the space of its full 900-plus pages gave me hours of sheer, lowbrow pleasure. "...women were writing crime, and it seems that their texts have somehow been repressed or dismissed in favor of the male canon." Once again I've picked up a novel that not very many people will want to read, and that's okay. I wouldn't have even known about it before starting this project, but as it turns out it was a fine novel, easy to read, and above all, fun. Midway through this book something came up in the reading that made me think about tossing it across the room, but then I decided to give it a chance because I was at the point of being heavily invested. Oh my gosh -- I'm so glad I did! It's one of the most seriously twisty crime novels I've read in a very long time. Note I said "twisty" rather than "twisted" -- big difference. 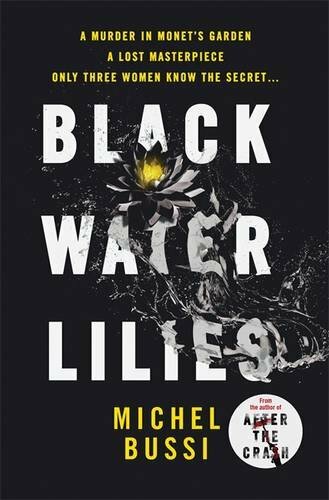 Black Water Lilies is another one of those rare books where I was just plain speechless, overwhelmed, stunned, blown away and other words describing my complete surprise by the time I got to the end when I realized exactly what the author's done here. And while I had some issues with the writing here, on the whole I say well done!! People -- put this book on your tbr pile right now. It's a tough novel to summarize without giving anything away so I won't say too much more than what someone could find on the back cover blurb. 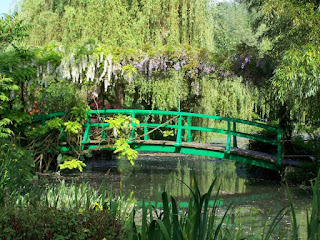 The novel is set in the small village of Giverny, France, site of the home and gardens of artist Claude Monet, who had moved there in 1883. There are three major players in this book -- an "octogenarian" widow through whom we get most of the story, a beautiful young schoolteacher, and an eleven year-old girl, Fanette, who is a gifted artist in her own right. The story spans thirteen days, over which the secrets of this small village slowly come to light. 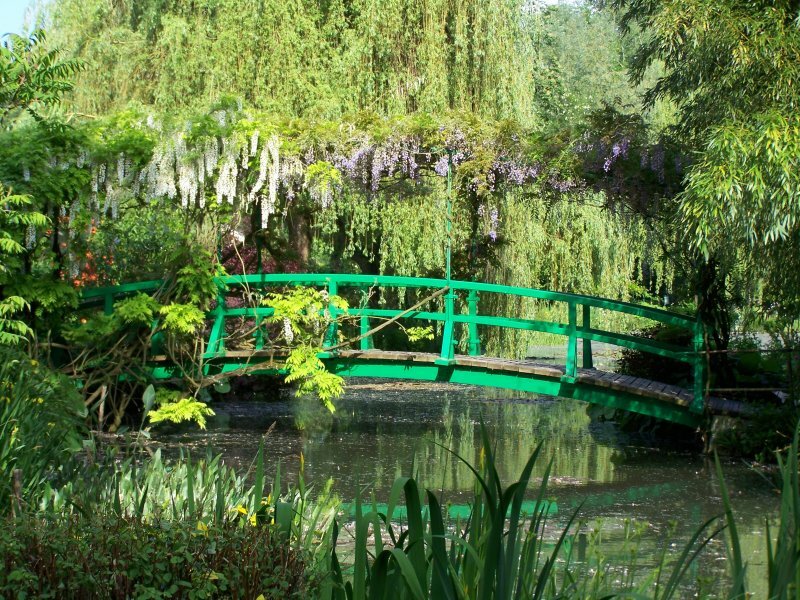 We don't wait long at all until the body of opthamologist Jérôme Morval is discovered in a brook that meanders through Monet's gardens -- he'd been stabbed, hit on the head with a rock and pushed into the water. All the police have to go on is a postcard of Monet's painting Water Lilies on which was written "Eleven Years Old. Happy Birthday" with a strip of paper glued to the card saying "The Crime of Dreaming, I agree to its creation," which police later discover comes from Louis Aragon's Aurélien. The police also discover that the married Morval was quite the ladies man, and begin to wonder if somehow his penchant for the ladies was cause enough to kill him. Inspectors Laurenç Sérénac and Sylvio Bénavides also look into rumors that Monet may have secreted as-yet undiscovered paintings in his former home as a possible motive. Speaking of Monet, read very carefully as you go through this novel -- it's not called Black Water Lilies for nothing. There are parts of this book that tend to be boggy and I think a lot could have been left out to make it much tighter, but really, it's all about the ending. When the reveal comes it comes in a big way, and I had to rethink every single thing I'd just read. My first thought was "holy crap -- that's genius!" and that's all I'm going to say about this book's plot. Any more would absolutely ruin things, and one of my online groups will be reading Black Water Lilies this month so I'm keeping shtum. Trust me, this is not your average police procedural, for which I am grateful. It takes a strong writer to make this much of an impression, and I'm so damn picky about what I consider good crime reads, so that says a lot. Would I recommend it? Hell yes! "has been abandoned by the woman he loves, continues to be demoralized by the his city's (and his nation's) ubiquitous corruption, and is dire need of some psychotherapy." "I'm a drunk weighed down by memories, a poor idiot who fell in love with the wrong woman, and to fall in love is to dream, to imagine a future that rarely comes to pass." He lives alone in his brother's house in the Col Pop, where he is looked after by his housekeeper Trudis who has her own issues. He's not someone particularly interested in justice, but he does have integrity; long-term, deeply-rooted connections, familial and otherwise that are important to him as a person, and this trait applies not just to people on his side of the law where it's often tough to tell who if anyone is actually in control. He'll also work like a dog to get a case solved despite his superiors' (and others') ideas to the contrary and often crosses into the underworld to do so. 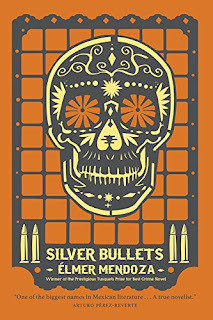 Silver Bullets revolves around a number of killings that have in common the use of silver bullets in the gun that does the killing. 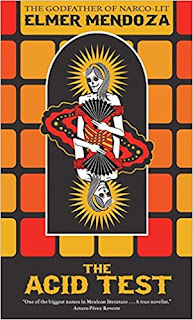 As the bodies start to pile up, Mendieta becomes frustrated trying to make connections between the victims, and he also wonders what motivates the killer to use such a bizarre method of doing away with his victims. Aside from all of the vampire and werewolf jokes people make, it seems that the local hitmen have nothing to offer in the way of help -- as one of them notes, it's not their style, since they mainly get "requests" from the rich who want their "target cut to pieces, drawn and quartered, castrated..."
"in this country justice is in the hands of criminals and as long as you people from the government whistle and look the other way that's how it's going to remain." 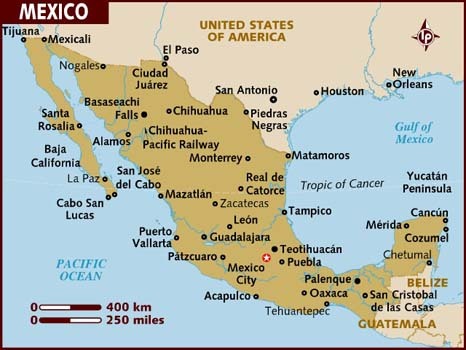 At the same time, no one can deny that along with the bad, drug money has brought a lot to the area in terms of the economy, and also that connections run deep here. in which Mendieta is caught up in a case that nearly sends him over the edge. As the story begins, the president of Mexico has just declared war on the narcos, which not only means that "badges are going to die," but also that the cartels will be gearing up to fight each other as well as the government to come out on top. But that's really the least of Mendieta's worries at the moment, since he caught the case of the murder of Mayra Cabral de Melo, a gorgeous Brazilian dancer/stripper with whom Mendieta had earlier spent some time. Her murder is extremely personal to him and now he's devastated. As he says, while trying to "understand the abyss into which he had fallen,"
"What's wrong with me? I wasn't even in love with her, I didn't see her for more than a few days; neither did she make love any differently. But she was the one who brought me back from the brink." Not only was she murdered, but she had also been mutilated, marring her perfect body in death. He wants to know who killed her and why,. and he will go to any lengths to find out, including tapping his connections in the criminal realm to gain information. As part of his investigation, Mendieta has to question not only criminal suspects, but politicians, high-level cops, Americans and others, and he is told that he needs to drop the case. Around his search to find Mayra's killer, the cartels go at it with each other and with the DEA, but even there, trust is only a matter of opinion. As I said earlier, Mendoza's work is very difficult to read because of his writing style, for which "challenging" as a description is an understatement. At the same time, because it was such tough going, I found myself having to read at snail's pace and it paid off. 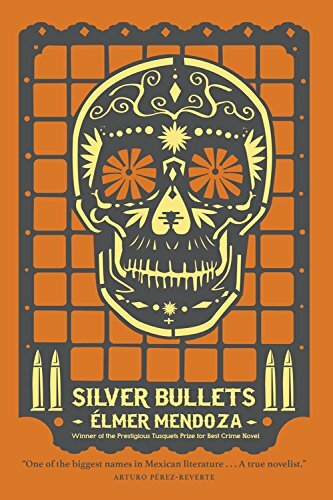 As it turns out, these books are not simply just two more books about drug cartels filled with lots of violence -- of those there are plenty, a dime a dozen these days. Instead, they're much more about living and functioning in a place where drugs (and the resulting violence) aren't going away any time soon, since they mean big money for the economy. The books also shine a spotlight on the very human character of Mendieta, who kind of does his own thing less as a member of the police force than as an individual who wants answers and who knows how to find them. I genuinely loved these books once I figured out that I needed to move through them uber-slowly, and I seem to be swimming upstream from many readers who were stuck on style. Yes, they're difficult, and yes, it's not easy getting through them, but in the long run, they are so worth it for readers up to a major challenge.